Worn by royalty throughout history, sapphire belongs to the corundum mineral group along with ruby. In ancient times, it was believed that sapphire colored the sky. Sapphire is a classic; one of the “Big Three”. It rates 9 on the Mohs scale, second only to diamond and is considered durable enough even for men’s wear. It is a popular alternative for an engagement ring. However, as with all fine jewelry, diamonds, and gemstones, sapphire requires some care in wearing. Sapphires can chip and scratch with heavy wear, so it’s recommended to take your rings off when active. Due to sapphire’s high refractive index and hardness, they are a vibrant gemstone. Blue is the most common color, but sapphire is found in almost every color in the rainbow. Sapphires are mined in Australia, Burma, Sri Lanka, and East Africa. Sapphires are also mined in Montana and are named “Yogo” sapphires for their Yogo Gulch origin. Fine cornflower blues are typical in “Ceylon” or Sri Lankan sapphires. Some consider this color bright and open. Vivid blue is the most valuable, mainly mined in Burma. 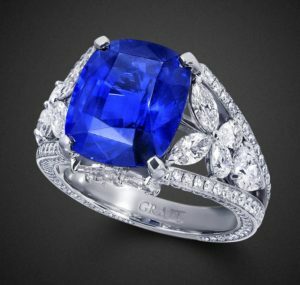 However, the pinnacle of fine color blue sapphire is the Kashmir sapphire. Discovered in the late 19th century, sapphires mined in the Kashmir region display an electric blue unrivaled by any other. The mine was exhausted only 50 years after it was discovered, and you will only see Kashmir sapphires from older jewelry. Most “blue” sapphire that’s marketed today is mined in Australia, the largest volume producer of sapphire in the world. This commercial (low) quality sapphire is dark ink blue and runs about $300 retail for a one-carat gemstone. Fine quality sapphire runs $3,000 to $4,000 for a one-carat gemstone. 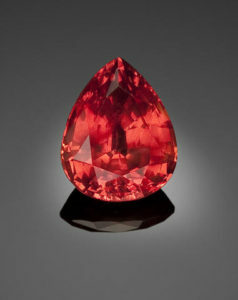 Padparadscha is the rarest color of sapphire. Think of the color of a warm tropical sunset. Orangey­ pink, a perfect balance of the two. These gems are even scarcer than fine rubies. The vast majority of sapphires of all colors are heated to raise clarity (dissolve inclusions) and enhance color. Diffusion is another type of treatment used to enhance color. Diffusion is a highly contested form of sapphire treatment, mainly due to the fact that the color saturation is only skin deep and can be affect with scratching or re-polishing. Star sapphires and rubies are a phenomenal gem. Reflection of rutile needles within the gemstone cause the star, or asterism, intersecting in a hexagonal pattern (following the hexagonal crystal growth). Fine star sapphires were very popular about 40 years ago, but the industry has seen a decrease in availability of stars due to the prevalence of heat treatments at the source. Quality factors in stars are a sharp (not blurry or wavy) six-sided star that extends to the edges. A top-quality gem will be translucent with a top not too high or shallow and a bottom not too heavy. And, of course, saturation of color is important. Sapphire is said to foster creative expression, intuition, meditation, and mental clarity. 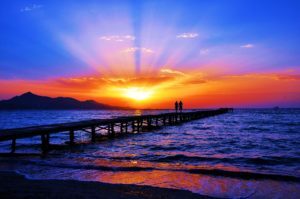 It is also considered an antidote for depression. 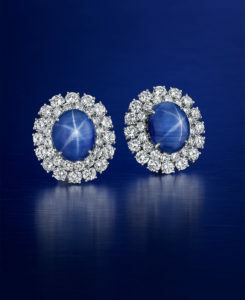 Medieval Kings believed that sapphire would protect them from harm and envy. By the time of the Renaissance, sapphires were coveted by the wealthy and influential. Sapphires were credited with the ability of preventing poverty, making an irritable man good-tempered and a stupid man wise. Blue sapphire is considered September’s birthstone as well as representing the 5th and 45th wedding anniversaries. All sapphires are durable and wear well in rings.